The Pinholes have been active in the S-ROCK scene for some time now. Through personnel changes, singer and principal songwriter Famie Suliman remains the constant as the band continues to carry out its retro pop mission with aplomb and no small amount of fun. The single “Sunshine” is The Pinholes’ opening salvo before the release of its debut full-length (sometime this year?) and this live favourite is given the happy production treatment its cheerful sound thoroughly deserves. Light-hearted and infectious, listeners are guaranteed a splendid 60s poppin’ time with this authentic pastiche/tribute to a special era. “Sunshine” is now available from Bandcamp. To be honest, I never expected to write this review. Up to the point that I received the email from Peipei (LIKES Communications), I had not even heard of Hong Kong/Canadian singer-songwriter Ellen Loo. 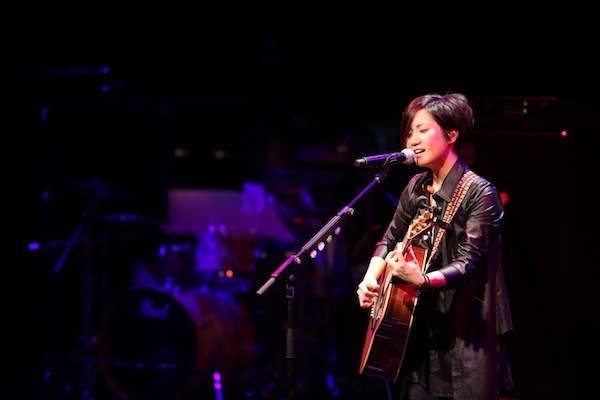 And when Peipei invited me to catch Ellen’s show at the Esplanade Recital Studio, I was feeling a bit mixed. After all, I am not, by any stretch of the imagination, a fan of Mandarin pop but I thought – “nothing ventured, nothing gained” – and I am so glad that I took the plunge. What will be the next rock trend the new kids on the block will cotton on to? Well, in the last five years the post-punk/new wave of the 80s has been fairly squeezed dry by new bands so perhaps now it’s time to move up a decade. If we look at the early 90s, power pop definitely was popular enough for major labels to sign the likes of Weezer, Jellyfish, Teenage Fanclub, Semisonic, Fastball, Superdrag, The Grays, Wanderlust and the like. It has been a long while but suddenly out of the blue, we have a NEW David Bowie single (“Where Are We Now?”) and album (The Next Day)! More news to come but in the meantime, just enjoy this moment and the haunting video below. Beautiful. There are numerous landmarks achieved with this, the debut album of synth-pop combo, Depeche Mode. Released by Mute Records, it was a rare genuine indie album for its time. Speak and Spell contained also many songs which were amongst the first electronic numbers heard on the airwaves e.g. “New Life”, “Just Can’t Get Enough” and my personal favourite, “Dreaming of Me”. The use of synthesizers instead of the usual guitar, bass and drums instrumentation was so refreshing back in 1981. But what made the music of early Depeche Mode so memorable and timeless are the brilliant songs. Pop songs filled with hooks that captured the imagination of the post-punk generation, and taking Kraftwerk’s uncompromising electronic agenda to its logical conclusion. The album was also the only Depeche Mode LP with then-prinicipal songwriter Vince Clarke (who’d go on with further success with Yazoo, The Assembly and Erasure). Martin Gore would come to the fore in Clarke’s absence, turning the outfit towards the darker material it would become world famous for in subsequent years. Three decades later, thanks to the post-punk revival, Speak and Spell is as relevant as it ever was. Essential. Simon Townshend released one of the more intriguing albums of 2012, the under-rated Looking Out, Looking In. We were fortunate and privileged to be able to pose a couple of questions to Townshend via email and we set out his responses below. As a musician/recording artist, has being the younger brother of Pete Townshend been an advantage or disadvantage and why so? I think it works both ways. I suppose I have a lot to live up to, especially when some people expect so much of me. Having said that my name has opened a few doors that would have perhaps remained shut. I am really proud of my brother and have always loved his music / lyrics – The Who are one of my all time favourite bands. However, I have many other musical influences and my sound is unique. I think once people realise that the sibling association takes a back seat they will judge me on my own merits. At the end of the day it’s down to me and my music to win music lovers over.